Also known as virtual worlds, the 3D Internet is a powerful new way for you to reach consumers, business customers, co-workers, partners, and students. It combines the immediacy of television, the versatile content of the Web, and the relationship-building strengths of social networking sites like Face book . People who take part in virtual worlds stay online longer with a heightened level of interest. To take advantage of that interest, diverse businesses and organizations have claimed an early stake in this fast-growing market. 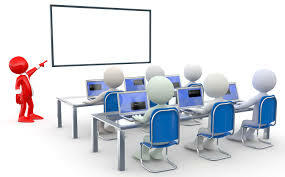 They include technology leaders such as IBM, Microsoft, and Cisco, companies such as BMW, Toyota , Circuit City , Coca Cola, and Calvin Klein, and scores of universities, including Harvard, Stanford and Penn State . The success of 3D communities and mapping applications, combined with the falling costs of producing 3D environments, are leading some analysts to predict that a dramatic shift is taking place in the way people see and navigate the Internet. The appeal of 3D worlds to consumers and vendors lies in the level of immersion that the programs offer. The experience of interacting with another character in a 3D environment, as opposed to a screen name or a flat image, adds new appeal to the act of socializing on the Internet. Advertisements in Microsoft's Virtual Earth 3D mapping application are placed as billboards and signs on top of buildings, blending in with the application's urban landscapes. 3D worlds also hold benefits beyond simple social interactions. 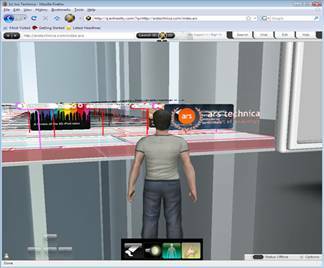 Companies that specialize in interior design or furniture showrooms, where users want to view entire rooms from a variety of angles and perspectives, will be able to offer customized models through users' homePCs . Google representatives report that the company Google is preparing a new revolutionary product called Google Goggles, an interactive visor that will present Internet content in three dimensions. Apparently the recent rumors of a Google phone refers to a product that is much more innovative than the recent Apple iPhone. nyone putting on "the Googgles" - as the insiders call them - will be immersed in a three dimensional "stereo-vision" virtual reality called 3dLife. 3dLife is a pun referring to the three dimensional nature of the interface, but also a reference to the increasingly popular Second Life virtual reality. 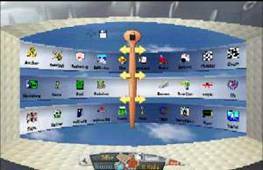 The "home page" of 3dLife is called "the Library", a virtual room with virtual books categorized according to the Dewey system. Each book presents a knowledge resource within 3dLife or on the regular World Wide Web. If you pick the book for Pandia, Google will open the Pandia Web site within the frame of a virtual painting hanging on the wall in the virtual library. However, Google admits that many users may find this too complicated. 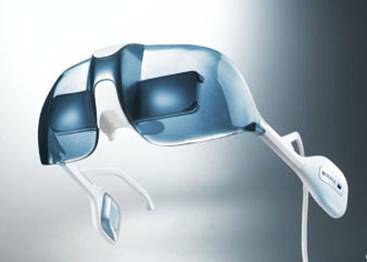 Apparently Google is preparing a new revolutionary product called Google Goggles, an interactive visor which will display Internet content in three dimensions. A 3D mouse lets you move effortlessly in all dimensions. Move the 3D mouse controller cap to zoom, pan and rotate simultaneously. The 3D mouse is a virtual extension of your body - and the ideal way to navigate virtual worlds like Second Life. The Space Navigator is designed for precise control over 3D objects in virtual worlds. Move, fly and build effortlessly without having to think about keyboard commands, which makes the experience more lifelike. Hands on: Exit Reality: The idea behind ExitReality is that when browsing the web in the old-n-busted 2D version you're undoubtedly using now, you can hit a button to magically transform the site into a 3D environment that you can walk around in and virtually socialize with other users visiting the same site. This shares many of the same goals as Google's Lively (which, so far, doesn't seem so lively), though ExitReality is admittedly attempting a few other tricks. Installation is performed via an executable file which places ExitReality shortcuts in Quick Launch and on the desktop, but somehow forgets to add the necessary ExitReality button to Firefox's toolbar . After adding the button manually and repeatedly being told our current version was out of date, we were ready to 3D-ify some websites and see just how much of reality we could leave in two-dimensional dust. Exit Reality is designed to offer different kinds of 3D environments that center around spacious rooms that users can explore and customize, but it can also turn some sites like Flickr into virtual museums, hanging photos on virtual walls and halls. Strangely, it's treating Ars Technical as an image gallery and presenting it as a malformed 3D gallery . 3D Shopping is the most effective way to shop online. 3DInternet dedicated years of research and development and has developed the worlds' first fully functional, interactive and collaborative shopping mall where online users can use our 3DInternet's Hyper-Reality technology to navigate and immerse themselves in a Virtual Shopping Environment. Unlike real life, you won't get tired running around a mall looking for that perfect gift; you won't have to worry about your kids getting lost in the crowd; and you can finally say goodbye to waiting in long lines to check out.